Corning your own beef for St. Paddy's day is a cinch. Will you be enjoying corned beef and cabbage this St. Patrick's Day? You should. It's very easy to make. In fact, corning your own beef is no more complicated than brining a chicken or turkey (although it does take longer). If you're going to make your own corned beef from scratch—which will be so much better than prepared corned beef from the supermarket—you'll need to get started right away. Like I said, it's not difficult to corn your own beef, but it will take about five days, so plan accordingly if you want to eat it on St. Paddy's Day. Regarding the origins of corned beef in America, according to Michael Feldman, owner of Feldman's Deli in Salt Lake City, "Creativity was used to develop tasty kosher meats from cheap cuts like brisket, navel or tongue, employing old European preserving techniques. The kosher salt used to infuse meat with flavor, for example, looked like kernels of corn, which lead to the term 'corned' beef." There is much debate among food historians as to whether or not corned beef is actually of Irish origin. Apparently, corned beef can be traced back to the 12th century in Ireland. The first time it's mentioned in print is in the poem "Vision of MacConglinne." However, it is described as a king's delicacy. For most of the Irish, cattle were kept for milk and not slaughtered for food. Anyone who did eat beef in 12th-century Ireland probably would have eaten it fresh, because salt (a preservative) was prohibitively expensive. Many historians think that it wasn't until the 18th-century wave of Irish immigration to the United States and Canada that most Irish people tasted corned beef. As Feldman mentioned, both beef and salt were relatively cheap and readily available here, while they were luxury items in Ireland. Regardless of the history of the dish, corned beef and cabbage will not be on most dinner plates of the Emerald Isle come St. Patrick's Day. Most of it will be served to tourists. Although it does turn up on some Irish tables, it's more likely to be served at Easter time. I've asked Irish friends about eating corned beef and cabbage on St. Paddy's Day, and most can't figure out why we do so here in America. "It's so plain," said a friend. The Irish themselves seem to prefer a dish called boiled bacon and cabbage, which uses a shoulder cut of brined pork. Still, I absolutely love corned beef, so I'll be keeping with my tradition of forcing my corned beef and cabbage down the gullets of my family and guests on St. Patrick's Day. Ingredients for making your own corned beef from scratch are readily available at most grocers. The exception might be pink salt, but I've found pink salt at places like Harmons and even Home Goods. You could always order it online or just skip it. It's not essential, but pink salt gives corned beef its deep red color. Combine 1 gallon of water in a large pot or Dutch oven with the kosher salt, sugar, pink salt (if used), garlic and 2 tablespoons of the pickling spice. Bring to a simmer and stir until the salt and sugar are dissolved. Remove from heat and let cool to room temperature, then refrigerate until chilled. Once the brine is chilled, place the brisket in the pot and weigh it down with something like a dinner plate to keep it submerged in the brine. Put it in the fridge and forget about it for five days. 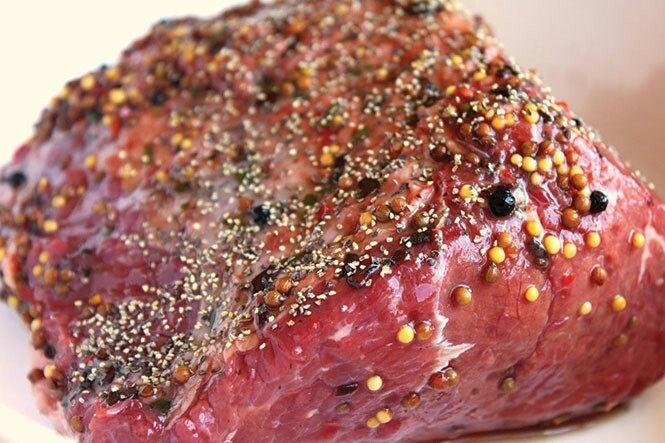 When you're ready to cook the corned beef, remove the brisket from the brine and rinse it thoroughly with water. Place the brisket in a pot just large enough to hold it. Cover with water and add the remaining 2 tablespoons of pickling spice, carrot, onion and celery. Bring to a boil over high heat, reduce heat to low and cover. Simmer gently until the brisket is fork-tender, about three hours, adding more water if needed to cover brisket. Keep warm until ready to serve. Don't worry; it's pretty hard to overcook corned beef. The meat can be refrigerated for several days in its cooking liquid. Reheat the corned beef in the cooking liquid or serve chilled. Slice thinly and serve on a sandwich or with additional vegetables and potatoes simmered until tender in the cooking liquid. If you decide to opt out of making your own corned beef, plenty of Irish-themed pubs, bars and restaurants will surely have some available over the holiday. Some of the spots that are sure to be brimming with green include MacCool's Public House, Piper Down Olde World Pub, Fiddler's Elbow, Flanagan's, Molly Bloom's, Murphy's Bar & Grill, The Republican, Leprechaun Inn, Rock and Reilly's, Green Pig Pub and Poplar Street Pub.